Planning a vacation or taking a trip to visit family and friends? Before you book your lodging, make sure you’re not missing out on any military hotel discounts. Whether you are traveling now or sometime in the future…going away for a day or a month…you and your dependents may be eligible to receive special savings — and qualifying for your discount is usually as simple as showing your military ID. The following list includes some of the larger hotel chains that offer discounted military rates, although many independent hotels, motels, and bed and breakfasts also provide savings to active duty service members. So even if you do not see a particular hotel listed here, when making your reservation, don’t forget to ask if you qualify for any military discounts and bring your military ID with you. Aqua Hotels & Resorts – Aqua Hotels has hotels throughout Hawaii and offers 10% off to military members. There are also special TLA and long stay rates available for military groups. Best Western – Best Western hotels offer military personnel and civilian military personnel including veterans and American Legion members discounted rates of 10% or more off the Best Available Rate throughout North America. Choice Hotels – Over 2,700 participating Choice Hotels properties around the world offer guaranteed discounts on one or two person rates to active duty and retired military personnel and their dependents. The company also has established the Choice Privileges Armed Services program for U.S. active duty or reserve military members, retired military, National Guard, U.S. Coast Guard, and eligible spouses/dependents. This reward program automatically puts the member at Elite Gold status which includes a 10% point bonus on all eligible stays and other exclusive member benefits. Choice Hotels properties include Comfort Inn, Comfort Suites, Quality®, Sleep Inn®, Clarion®, Cambria® Suites, MainStay Suites®, Suburban Extended Stay®, Econo Lodge® and Rodeway Inn® hotels. Disney Hotels – Select rooms at Disneyland and Walt Disney World resort hotels are available at a discount to active or retired members of the U.S. military including the National Guard, the U.S. Coast Guard, and Reservists. While the offer is valid for most nights through December 19, 2017, there are some blackout dates. Eldorado – The Eldorado Resort Casino in Shreveport, LA supports the military with an exclusive 10% off the prevailing room rate. Extended Stay America – Extended Stay America offers government TDY and PCS rates for its studio apartment suites. It also honors the DoD Flat Rate Policy and offers rates at or below 75% of Per Diem when staying consecutively for 31 nights or more on official travel (based on availability). There are many locations near military bases and pet-friendly rooms are available. Grand Sierra Resort and Casino Reno – Military, reserve and veterans can receive 25% off hotel room rates at this entertainment-filled casino and resort in Reno, NV. Discount is available throughout the year but availability restrictions may apply. Great Wolf Lodge, Pocono Mountains, PA – As part of the Howling Heroes discount, active and retired military can receive up to a 30% discount at this hotel and outdoor and indoor water park resort. Hard Rock Hotel San Diego – As a thank you for your rockin’ service, the Hard Rock Hotel San Diego offers a special military rate. Hilton – Participating Hilton hotels & resorts are offering active and retired military, veterans and their families exclusive savings off leisure stays. InterContinental Hotels Group (IHG) – Military personnel on official travel can enjoy government rates at participating IHG hotels including InterContinental Hotels & Resorts, Holiday Inn Express, Crowne Plaza, Hotel Indigo, Candlewood Suites, Staybridge Suites, and on-post IHG Army Hotels. 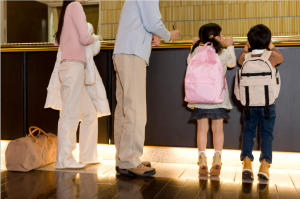 There are over 3,000 participating hotels worldwide and discounts apply to short-term and long-term stays. La Quinta Inns & Suites –The La Quinta Returns Military Rewards program offers exclusive benefits to active or retired military (and spouses) including 12% off the best available rates, instant La Quinta Returns Gold Status, 2,000 bonus points after the first stay, free nights and more. La Quinta is known for its support of military families and has a page that makes it easy to find locations near military installations. LEGOLAND Hotel – Military families can enjoy the LEGOLAND California Resort and a night at the LEGOLAND Hotel at exclusive savings. Book online or call and ask for the Military rate. Marriott – Marriott hotel properties, including Marriott Hotels & Resorts, Residence Inn, The Ritz-Carlton, Courtyard, SpringHill Suites, and Fairfield Inn & Suites, offer federal government rates to U.S. military personnel. Motel 6 – Active and retired military service members and their families can receive a 10% discount on all rates at all 1,300+ locations. Myrtle Beach Hotels – Many hotels in the Myrtle Beach, SC area offer military discounts and special offers throughout the year. Visit this page for a listing. Pacific Beach Hotel – Enjoy some R&R at the Pacific Beach Hotel located in Waikiki, Hawaii. This hotel’s military discount includes complimentary self-parking ($25 value), a complimentary daily amenity fee (normally $20 plus tax), flexible cancellation policy, and more. Red Lion Hotels – Military families receive up to 30% off best available rates at participating RLHC properties nationwide. Seminole Hard Rock Hotel & Casino Tampa – Active duty service members and National Guard with credentials can receive discounts of up to 10% for hotel rooms. The discounts are available year-round. Sheraton New York Times Square Hotel – This hotel at the center of the Big Apple offers a choice of offers to active-duty military including special government rates, government rates plus breakfast and 800/local calls, and government rates plus a $20 food and beverage credit. Silver Legacy – Military members are eligible for promotional room rates at the Silver Legacy Resort Casino in Reno, NV. Starwood Hotels – Starwood Hotels & Resorts Worldwide, Inc. offers exclusive military rates at participating North American hotels and resorts. All discounts require presentation of your military ID. Visit individual websites for military hotel discount details, restrictions and other information.